Residents in Flint, Michigan, are still relying on bottled water for their everyday needs. Don’t count on finding Nestlé water in many homes, though. You can, however, find Nestlé about 100 miles away drawing huge amounts of water from the White Pine Springs—for just $200 a year. That’s got many Michigan residents pissed. So pissed, in fact, that the Michigan Department of Environmental Quality (MDEQ) received more than 80,000 comments against the multinational corporation’s proposal to increase the amount of water it pulls from this spring head from 250 to 400 gallons per minute. Just 75 comments supported the proposal. Despite the public opposition, the state approved the permit Monday. “We cannot base our decisions on public opinion because our department is required to follow the rule of law when making determinations,” said MDEQ Director Heidi Grether, in a press release. The reason giving water away to a corporation practically for free has everyone upset is that many residents of the predominantly black city of Flint are still struggling to meet their basic water needs after the lead water crisis. Right now, the state is considering whether to end Flint’s water bottle distribution program, which it launched after the crisis began. 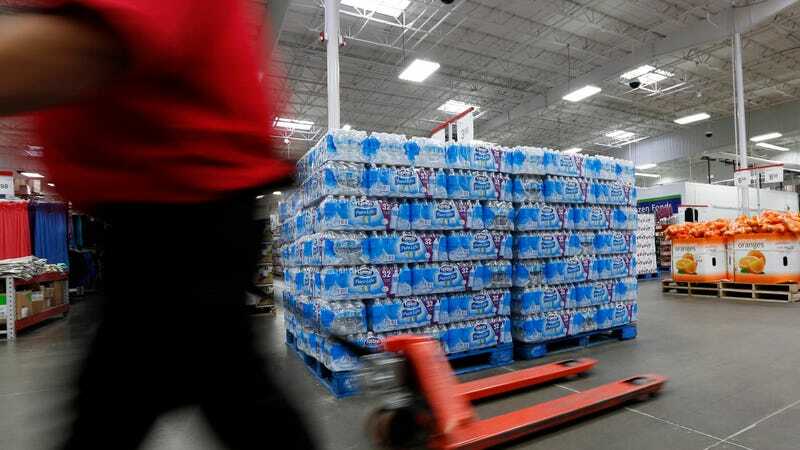 The state spent $22,000 a day this year alone on the bottled water, reports M-Live/The Flint Journal, and only four state-run PODS, as locals call them, remain in the city. Without free water, residents will resort to buying it, instead—or drinking tap water, which still isn’t completely free of lead, and which the state is still advising folks filter before drinking. And that’s not all. Residents of Flint must still pay their monthly water bills—which a 2016 study found was the highest in the country. On average, people paid $864 a year. Bills include service and connection fees that don’t go away if residents are barely using their tap water. Nestlé is paying less per year to draw groundwater than what some residents see on their monthly statement. “It was like a kick in the face,” says Gina Luster, an organizer with Flint Rising, to Earther. It’s true the company donated 190,000 bottles of water to the city immediately following the crisis. It also donated another 1.5 million bottles in 2016. But a single family may require 60 bottles to complete its daily needs of cleaning and cooking. In a year, that can add up to near 22,000 bottles—for one family. And the city’s got 100,000 residents, so do the math. Luster, for one, doesn’t want Nestlé water anywhere near her city anymore. “They better not come here with that Nestlé water,” she told Earther. What she wants to see is Nestlé be a good neighbor by helping pay for the city’s infrastructure repairs. That’s ultimately what’s making Flint’s water unhealthy: water pipes, not the water itself. “They made millions of dollars off of Flint,” Luster went on. In fact, the company’s water sales reached $543 million from Michigan water in 2016, as reported by Bloomberg. Nestlé got a long, complicated history with Michigan, where it’s been operating for the last 16 years. The company reduced the amount of water it pumped back in 2009, from 400 gallons per minute to 218, after Michigan Citizens for Water Conservation sued it over concerns about what this water withdrawal could mean for lakes, rivers, and streams. All Nestlé’s got left to do is submit a monitoring plan, and its increased pumping can begin. Meanwhile, Flint residents may have to start paying for this water themselves. Oh, the irony.